The Imperial War Graves Commission (IWGC) took on a monumental task in the 1920s-30s: identifying, burying, and commemorating thousands upon thousands of WWI soldiers. This involved erecting stone commemoration (cemeteries and memorials) that would acknowledge the dead both individually and collectively. As implied by the name ‘Imperial’, the IWGC wasn’t just responsible for British soldiers: it was responsible for commemorating all the fallen combatants of the British Empire. 1915 poster designed by Arthur Wardle. 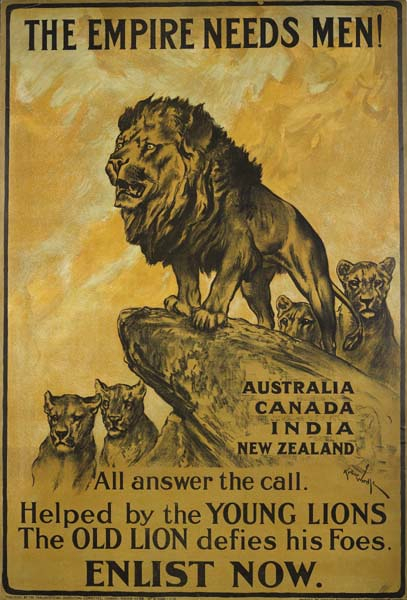 Enlistment posters provide fascinating insights into the compelling ties between Britain and her empire during the early years of the war. Source: Wikimedia Commons. At this time the British dominions and India were in a complicated position, falling somewhere between colony status and independence. These distinct and very different countries were subsumed under the umbrella of the IWGC in creating their material culture of remembrance on the battlefields, yet almost all had a national memorial constructed on the Western Front with which they were heavily involved. 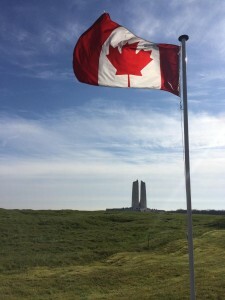 These are usually understood as national monuments representing unified experiences of loss and achievement, erected on battlefield sites that held special significance for each country. 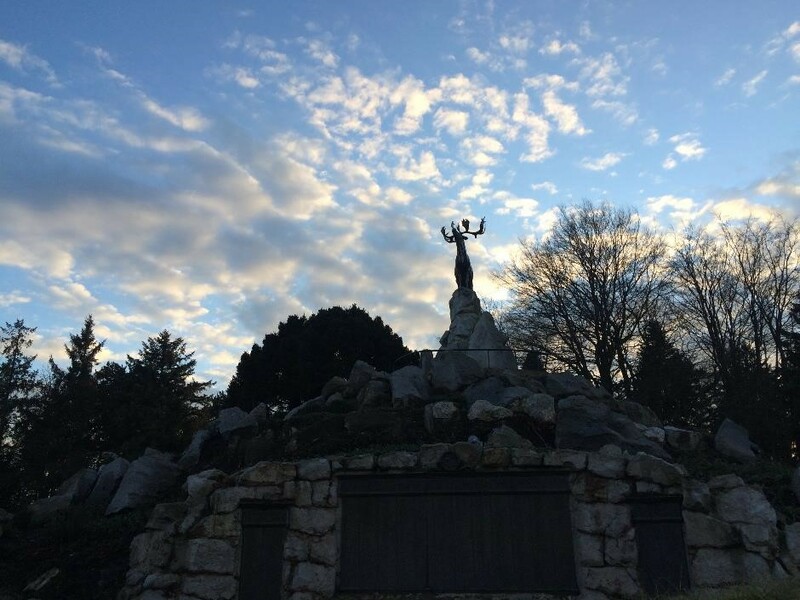 The centenary of WWI has prompted increased engagement with these memorials, including as epicentres of national mythologies; however, the centenary should also prompt us to critically re-examine these monuments. The Vimy Memorial, Canada’s national monument, with the Canadian flag. Photo taken by the author, 2016. While unquestionably serving to represent- and construct- national identity for Canada, Australia, South Africa, Newfoundland, and India, there is much more to the story. These memorials are hybrid sites: they each reflect, reinforce, or elide many aspects of identity, rather than a single cohesive narrative. Often, they represented Britishness as an integral part of their newly constructed “national” identities, rather than as an opposing force to react against. National unity did not negate loyalty to empire, but rather reduced the degree of subordination in the relationship. As such, India’s Neuve Chapelle memorial is topped by both the imperial British Crown and the Star of India; South Africa’s Delville Wood memorial represents ‘all the people of South Africa’ with a statue of twins symbolizing the two ‘white races’ of South Africa, one of which was the British; and Canada’s Vimy memorial is covered in allegorical sculptures (i.e. ‘Hope’, ‘Faith’, ‘Justice’) which allude to Canada’s shared identity with Britain based on universal values and shared experiences. The memorials also walk a fine line between representing individual and collective identity: they are both intensely personal yet defined by their representation of a collective. Most of the memorials include the names of their countries’ thousands of missing soldiers: Villers-Bretonneux, for example, is inscribed with the names of 10,738 missing Australians. However, Delville Wood has no names at all. Instead, the South African missing are listed on the British memorials, most famously at Thiepval. Each of these monuments are located alongside battlefield cemeteries, where known burials for each nationality receive individual headstones and thus the opportunity for a personalised epitaph from their family. 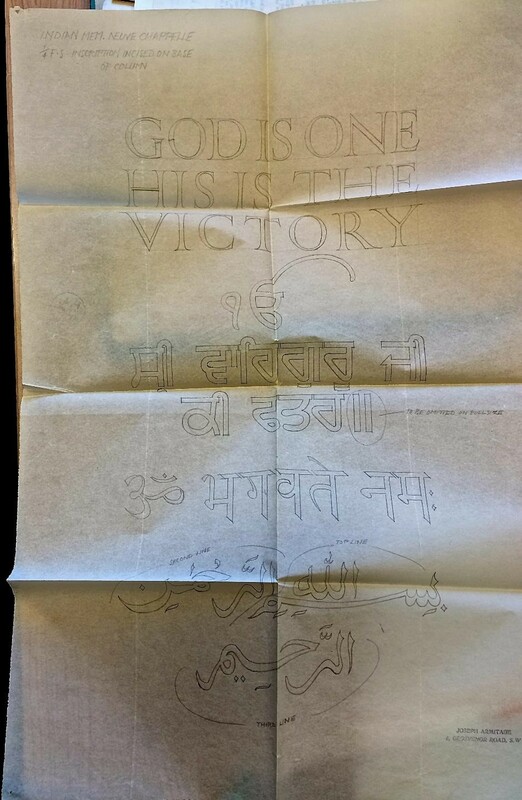 Yet, the soldiers listed on the memorials had to be summed up in just one inscription for each memorial as a whole: at Neuve Chapelle, for example, the phrase chosen was ‘God Is One, His Is the Victory’ in English, Hindi, Urdu, and Gurmukhi. Japanese Canadians were only reluctantly admitted into the armed forces in small numbers, and after serving in the war returned home to a country that denied them the right to vote for another 13 years. During the war, 9,000 Canadians were sent to internment camps, because they had previously immigrated to Canada from the Central Power countries. English and French Canada were sharply divided, which particularly came to a boiling point over the issue of conscription. 4,000 Canadian soldiers were of Aboriginal descent and faced continuing discrimination in the postwar period, including lack of access to some services afforded to white veterans. The 70,000 Black South Africans of the Native Labour Corps did not receive the British War Medal, while their white officers did. In South Africa tensions arose over domestic commemoration, highlighting ongoing difficulties between Afrikaner and Anglo- South Africans. India remained composed of highly stratified societies, some under the British Raj and some part of Princely States, which were segregated according to the caste system. ‘India’ was not a heterogeneous country, but rather included people practicing at least six different faiths, speaking many different languages, and representing a wide variety of ethnicities. Newfoundland’s memorial at Beaumont-Hamel. The caribou is an iconic symbol for Newfoundlanders and can also be found at other Newfoundlander memorials and headstones of WWI. Photo by the author, 2016. All of these factors coalesced to produce memorials that represent a more complicated narrative than might be assumed at first glance. Memorials are an important source to help us understand the lives of those who died and those who missed them. By examining the forms they took and the historical contexts that shaped them, we can better understand: which aspects of identity were represented and reinforced in these monuments; who decided and why; and how this continues to influence contemporary conceptions of these sites and the identities they embody. One IWGC epitaph in France states, “Time passes but love and remembrance live forever”; colonial memorials provide a fascinating demonstration both of the truth of this statement and of how not just love, but other motives and omissions, went into these perpetual sites of remembrance. *This image has no known copyright restrictions. 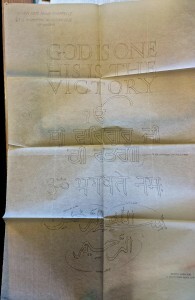 Source: Commonwealth War Graves Commission Archive in Maidenhead, UK, file number WG 861/2/4. Photo by the author, 2016. This entry was posted in Material Culture, The Memory of War and tagged Commonwealth, Remembrance, War graves, ww1. Bookmark the permalink.